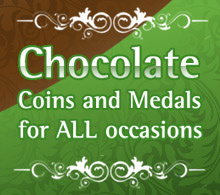 Heritage chocolate medals and coins make the perfect fun gift. Our personal coins and medals can also be used to create an exclusive retail range. Personalised designs can be combined with one of our range of standard designs to use on the reverse of the medal or coin. In addition to manufacturing the chocolate coins, we also offer a full design and packaging service, and can deliver a new design in as little as 6 weeks. Personalised coin and medal designs costs start at £350 for each side. In addition to our bespoke coins and medals, we also offer a standard range of designs which are ideal for gifts and to mark special occasions.